Homeless Connect is one of the most important events we have the privilege of hosting bi-annually with Homeward Trust. Founded in Edmonton in 2008, the event is a “Trade Fair” for over 1,400 guests who are either homeless or at risk of becoming homeless. As a community hub, we leverage our space and event expertise to help Edmontonians who might be marginalized by their circumstances, and donate food and meal preparation services. Our guests receive assistance with acquiring legal ID, crucial for many local aid programs. Homeless Connect provides guests with essential and dignity enhancing services, like dental, eye, and pre-natal care, hair cuts, tax preparation and more. First Nations, Inuit and Métis who attend Homeless Connect are able to seek counsel with an Elder and participate in smudging, an important act of cleansing, healing and reconnecting to their culture. Guests can experience the rare opportunity to take family photo taken (a reminder that the impacts of homelessness go beyond individuals), access the internet, and get a full load of laundry done – a basic service deeply appreciated by those who have gone without. Homeless Connect creates genuine connections within our community and guests have the opportunity to share their stories and build relationships. 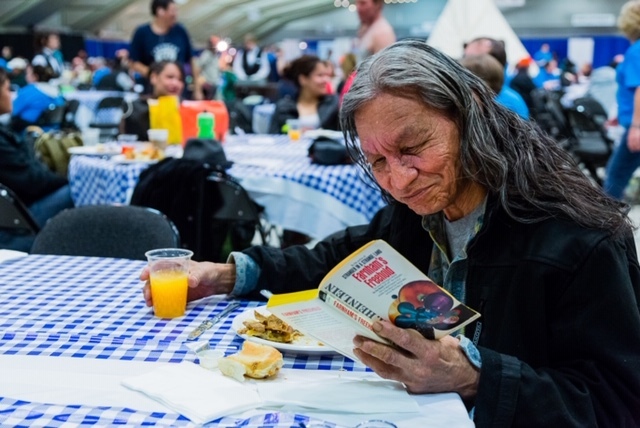 Homeless Connect Edmonton is the largest event of its kind in Canada, with over 2,300 guests accessing 70 services, with the help of more than 350 volunteers. To get involved and help, please click here. To see a list of clothing donations and drop-off locations, please visit Homeless Connect – Clothing Drive Poster 2019.